The Brook Red Lion Hotel has 24 individually furnished rooms that provide all the amenities guests would expect from a modern hotel, but with the added comfort of plush Tudor style interiors. There are three known ghosts - a small boy that can be seen in the Parliament restaurant occasionally and has appeared in a guest's photograph, a ghostly monk that hangs around in reception, but the most active is Alice Millar. Alice has regularly been heard whispering and even talking to staff. There are recent accounts of people's hair being pulled and a womans voice appearing on a video taken in one of the rooms, with no obvious cause. The most active spirit at the Inn is that of Alice Katherine Millar, murdered in 1638, she now haunts the building. Her ghostly apparition was reportedly so frightening that, 200 years ago, the owner of the Red Lion Hotel bricked up the doorway to her old room. He hoped that this would stop her ghost from appearing in the hotel. Guests have reported seeing Alice's ghost in rooms 5, 6 and 10, her apparition has also been seen in the kitchen and walking through the bricked up doorway which once led to her room. Recently the assistant manager at the hotel woke up at 3am like a bolt of electricity had gone through his body. As he looked around the room a beam of moonlight landed on the rocking chair next to his bed. As he watched, it began to rock backwards and forwards, slowly Alice appeared sitting in the chair. She spoke to him and asked "are you alright?" When he replied "yes", she disappeared. In the early hours of the morning, the shadowy figure of a hooded monk has been seen wandering the hallways and the reception area. The monk is said to have died in a fire at the Inn, whilst trying to save the children that were in his care. The third ghost at the Hotel is that of a small boy, his apparition has been seen in the parliament room. The apparition is often usually reported by children, it is said that he makes his presence felt by appearing in photos taken by the guests. The original rooms still have their original wattle and daub beams and are simply stunning. They are also, obviously, the most haunted. The ghost hunt will include a paranormal investigation of the most active public areas of the hotel, including several of the haunted bedrooms. VIP tickets available at Red Lion Hotel for £10 extra per person, see VIP info for information. 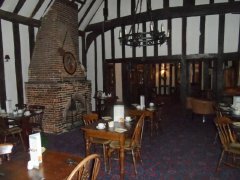 If you are considering staying overnight after the ghost hunt at The Brook Red Lion Hotel, please contact us for preferential room rates which include breakfast. You have a choice of a haunted room or a non haunted room!! 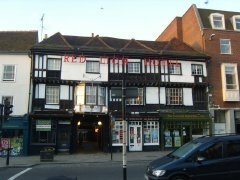 Read our Investigation Reports from The Red Lion Hotel. View all our evidence from Red Lion Hotel. 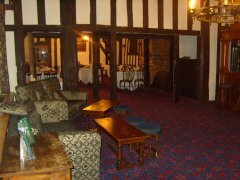 The Red Lion Hotel is available for private bookings, see Group Events for more information and pricing. Had a great night at the red lion hotel last night!! All in all a very enjoyable night, thanks guys!!! This was my first proper ghost hunt and I found it successful. It was a great night, I would definitely do this again and recommend this. Thanks for a brilliant evening and thanks to Steve and Kym for being a great professional team! Paul and I just wanted to say a huge thanks once again for the ghost hunt at the Red Lion Hotel on Halloween, both Steve and Kym were great hosts and the buffet was a welcome sight. Great groups all round, nice and small which is sooooo much better than other companies. A big thank you to you and your team for a great event...Really liked the group séances & the table tipping in the bar area.